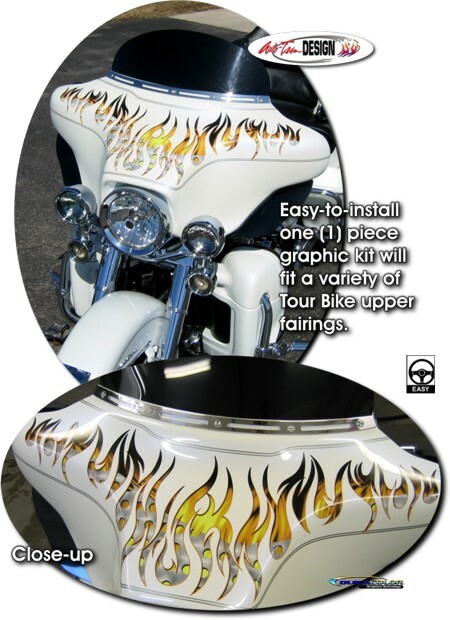 Set your bike apart from the rest with this "Hot" easy-to-install Brushed Metal & Flames Fairing graphic kit! Design elements of this kit include 3-dimensional simulated perforated brushed metal, flames and drop-shadows - all captured within the unique inverse flame pattern that is highlighted with a thin orange outline which fades to black at the top. This precut one (1) piece graphic kit is uniquely designed to fit a range of Harley-Davidson's Touring line upper fairings as shown. Digitally printed with our DuraCOLOR graphic technology, kit is manufactured with premium automotive grade vinyl film materials and looks great when installed! As a further step, graphic is covered with a 2.5 mil clear laminate which provides protection from miles of abuse. While this kit is specifically made for the Harley-Davidson Ultra Classic Electra Glide, Electra Glide Classic, Electra Glide Standard, Street Glide or Road King, this kit can creatively be used on just about any bike. Includes easy-to-follow general online installation instructions and care guide. Get your kit today!